This was a personal project that I wanted to use to take advantage of what I have learned about laser cutters. My goal was to be able to design a lamp using laser cut materials. I also wanted the lamp to have panels that light up artistic designs cut into them by the laser cutter. This project also won the "3D Printing and Laser Cutting" prize at the 2018 UW Maker Summit. The main challenge of this project was designing the lamp entirely (except for the electrical components) out of 1/8-inch birch plywood, namely how to join the angled sections of the structure using plywood, and how to make the panels that hold the light-up part of the lamp interchangeable. Brainstorming and Sketching: Once I had a rough idea of the kind of lamp that I want to create, the first part of the design process was coming up with a lamp structure that would fulfill all the needed criteria; it needed to be aesthetically pleasing, structurally sound (using 1/8 inch birch plywood), and also be designed so that the lit-up panels could be replaced and switched out easily. 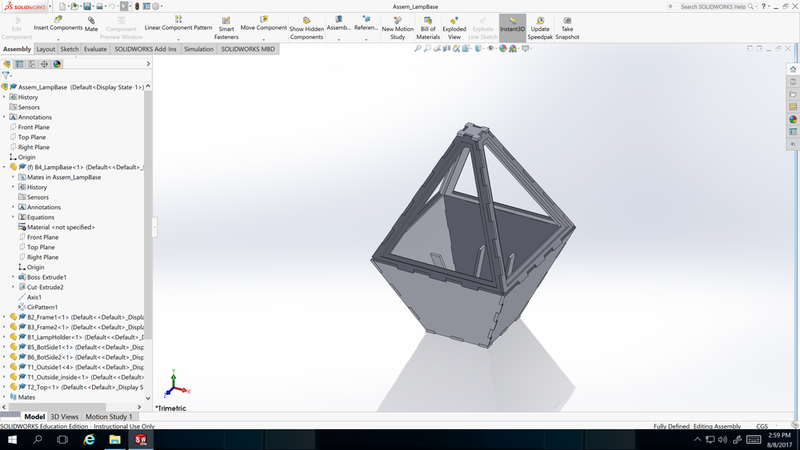 I next decided what type of light to use (MR16 bulb), and used the beam angle (120 degrees) and relative height I wanted the lamp to be to help fully define the dimensions of all of the sides in the lamp whn I moved on to building the CAD model. 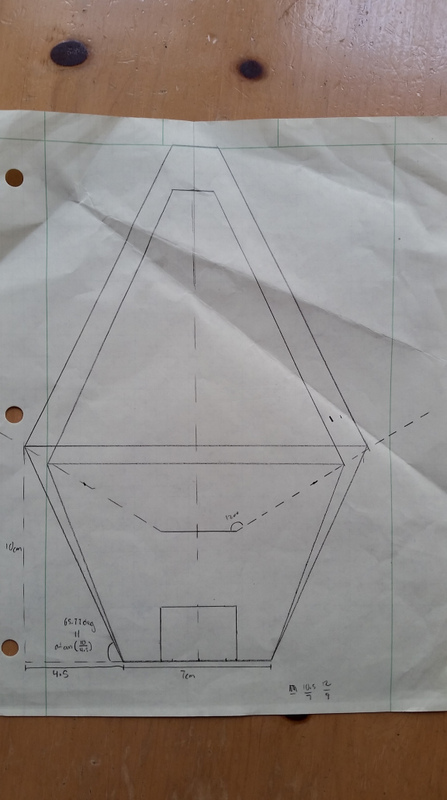 Designing: With the drawing stage done, I moved to Solidworks to design the entire lamp assembly. I started by designing all of the individual pieces, and then added the joineries between all of the parts. This part was particularly difficult because of all of the non-90 degree sides that join the lamp and required careful design and consulting with Solidwork’s interference detection to make sure all the joineries fit together correctly. I added “arms” in the internal structure that weren’t initially in my drawings; the arms were to help hold the bottom sides in place when gluing the parts together (it would have been hard to hold them at the correct angle when assembling otherwise). When this was done and all of the parts were correctly assembled together, the parts were exported to a file type that could be used for laser cutting. Artistic Design: During the brainstorm phase I decided that the light-up panels (or at least my first set of them) would be of constellations. Once I found constellations that would work well, I added the star constellations in Rhino, and then traced the animal shapes around the constellations for rastering. I couldn’t fully connect the constellation paths because the cut pieces would fall out after being laser cut. I solved this by leaving a small gap between the star location and constellation path. Assembly: Once all of the designing was done, the parts were laser cut, then stained and finished, and finally assembled. The assembly used glue on the joineries to keep it together. Only a couple small changes needed to be made after assembling to first design; the hole that was laser cut to hold the bulb socket need to be shrunk so that the piece could be more easily glued in place (the tolerance wasn't quite correct from my initial measurements), and the height of the slot that the power plug adapter went into needed to be increased slightly so that it would more easily fit in when assembled.